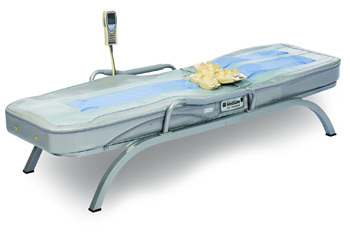 The All-New HY-7000UM Thermal Massage Bed System! Our latest and most advanced Thermal Massage Bed System. For nearly two decades, Migun have placed your wants and needs first and foremost. Now we’re taking those same desires to the next level with the classiest massage bed system ever made, HY-7000UM. By extraordinary demand, we’ve upgraded our finest model in exciting new ways. Migun users just like you originally suggested these features. Digital Remote – complete control of your experience is always within your reach. Digital Timer monitors length of massage while managing heat. More Intense Massage – features an additional treatment level. A higher top setting penetrates deeper and more intensely. Elevation – A slightly lift in height makes access easier and more effortless. Shapely Safety Handles – Newly designed support bars offer strengthen and grace. Mechanical Upgrade – The quality of the internal mechanisms is raised even above Migun unusually high standards. 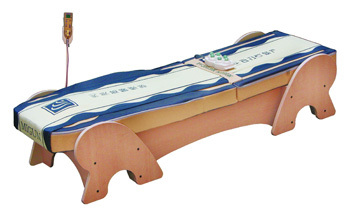 HY-7000 is an innovative and unique thermal massage bed system that is designed to provide a relaxing and soothing massage from the head to the ankle. The HY-7000 offers (7) different operating modes to provide you a massage like to no other. It’s not just a conventional massage bed; it’s a new way of a healthier lifestyle. Specific operational treatment modes combined with techniques provide a more deep and soothing therapeutic massage. The treatment area for Upper Body has been extended to cover the lower hip area. The treatment area for Lower Body has been designed to cover from thigh to ankle, thereby treating entire body. Users can choose from seven Operational Modes. External Jade Massage Heads can be used to treat desired areas effectively. The moving speed of Internal Jade Massage Heads can be changed as preferred. All new external 15-way jade massage heads and 2-way jade massage heads can be directly applied to desired areas for more effective use. The speed of the internal jade massage heads can be set to low, middle or high. Adjustable settings include: temperature of internal and external unit, movement and speed settings. All settings are easily controlled by the remote control. There is a new program that allows users to manually set treatment area and treatment time. The enlarged size provides more comfort and support. Our Timeless Original Classic Model with four different modes massage including unlimited possibilities provided from the manual hand heldexperience, the classic HY-5000C gives the whole family beautiful health and something to smile about. It’s our most cost efficient Thermal Massage Bed System. The HY-5000C Classic incorporates: P1 Basic Massage, P4 Finger Pressure Massage, P6 Abdomen Massage, and P7 Manual Massage. It’s more than a massage It’s the best of the east and west. All massages are not the same. 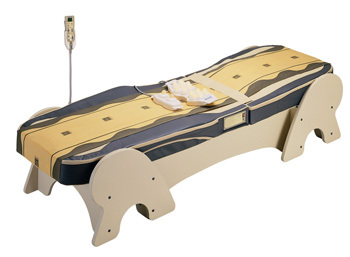 The Migun Thermal Massage Bed System is culmination of a new medical era. The result is a synergy between the holistic approaches of Eastern Medicine, the science based methods of Western Medicine and the advanced technology of Migun’s extraordinary system the most comprehensive massage in the world. For more details about this product, please click on the information links below. 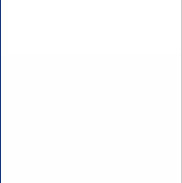 Acrobat reader is required to view the information links below, if you don’t have Acrobat Reader installed on your computer, please go to this link to download this file and install onto your computer system.